You have to cut 6 pieces. Now mark the center of all pieces. We are using the milling cutter and made a jig for that. But alternatively you may make the joining point using the chisel. Using the chisel. First cut as many stripes as possible using hand saw. 200 mm x 100 mm. Now chop the wood using the chisel. Double check if the joining part is smooth and the other piece fits perfectly in. Now sand using sanding paper no 120. Repeat with the second smaller piece. When both are finished, try them together. Now make the joining points to the center of longer pieces. Now sand all the pieces with the sanding paper no 120. 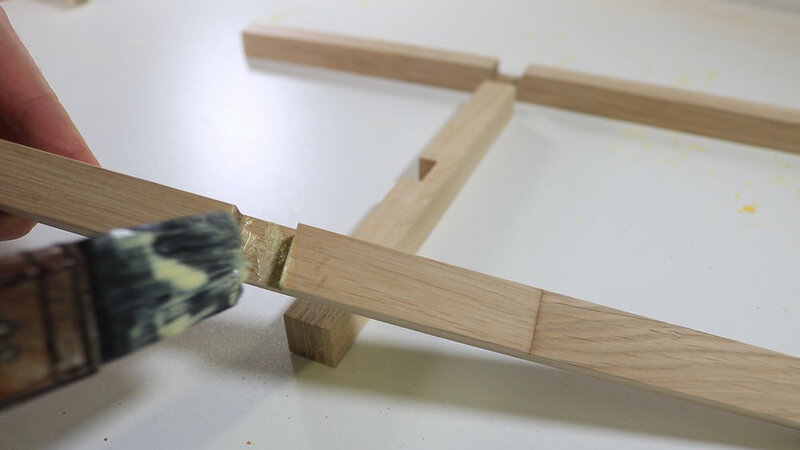 Connect by glueing the longer pieces to each other using a smaller piece. Make sure there will be no glue on the wood. Finish the plant stand using polisher or oil.